The complementary color of a primary color (red, blue, or yellow) is the color you get by mixing the other two primary colors. So the complementary color of red is green, of blue is orange, and of yellow is purple. The complementary of a secondary color is the primary color that wasn't used to make it. So the complementary color of green is red, of orange is blue, and of purple is yellow. Why are Complementary Colors Important in Color Theory? When placed next to each other, complementary colors make each other appear brighter, more intense. The shadow of an object will also contain its complementary color, for example the shadow of a green apple will contain some red. How am I Going to Remember This? 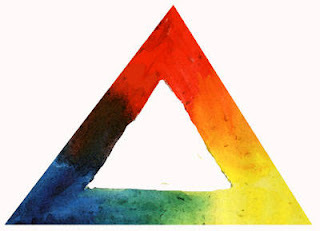 The color triangle as (shown above) makes it easy to remember: the three primary colors are in the corners. The color you get by mixing two primaries is between them (red and yellow make orange; red and blue make purple; yellow and blue make green). The complementary color of a primary color is the color opposite it (green is the complementary of red, orange for blue, and purple for yellow). Print out Color Mixing Triangle Worksheet and paint it in. It may seem like a simple exercise, hardly worth spending time on, but it's the first step in a fundamental painting skill -- successful color mixing. Put it up on the wall where you can see it at a glance until you've internalized which colors are primaries, secondaries, tertiaries, and complementaries. What Happens if You Mix Complementary Colors? If you mix complementary colors with one another, you get a tertiary color, particularly browns (rather than grays).